According to historian Emma Schwabenland Haynes in her unpublished manuscript, My Mother's People, all of the Volga Germans who settled in Portland became Americanized much more rapidly than did the members of the group who acquired farms in Colorado, California, etc. 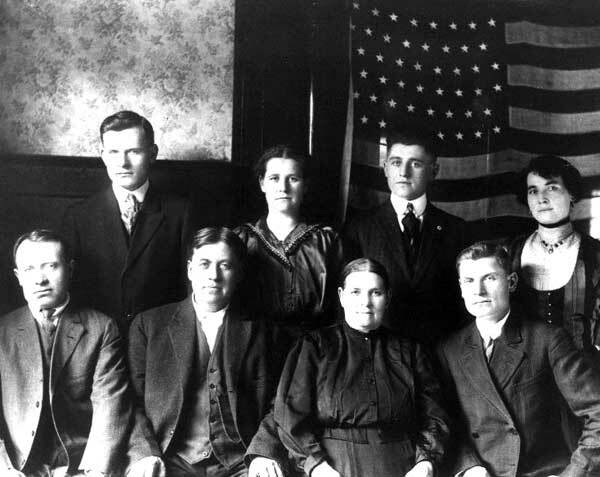 Since the Volga Germans who settled in Portland were thrown into immediate contact with their American neighbors, they learned to speak English very rapidly and they soon gave up many of the European customs that were continued in other part of the United States. Wacker family portrait taken in front of the American flag shortly after the family was reunited in Portland. Front row from left to right: Phillip, Johannes, Christine (née Schnell) and John. Back row from left to right: George, Emma, Henry and Kate. The Wacker family was from Norka, Russia. Photograph courtesy of Dee Price, granddaughter of Phillip Wacker. "The comparatively well-built houses and fine clothes of the Germans in Portland so overcame a certain Berthoud, Colorado farmer, who visited his granddaughter that he returned home filled with tales of the pride and shocking conceit of the inhabitants." "Our German people in this city are to be found in all ranks of society. We have a judge, a doctor, a dentist, several law students, five preachers, many businessman, and several lumbermen. Many men work in machine shops, grocery stores, meat markets, show stores, and dry goods stores. Our girls work in banks, offices, laundries, and factories. A rather important number of the men are street cleaners or have scavenger wagons. It would be impossible for me to give an estimate of the percentage of people engaged in each of these different occupations, although the larger number of people perform hard, daily work. On the other hand, each year finds us a little more improved; more of our children are going on to high school and colleges; better homes are being built, and an increasing number of men and women rising out of the laboring classes." "The assimilation of the Russian-German into the American way of life is an irreversible process. The life-giving artery of every non-English speaking group in the United States is the constant stream of new immigrants, which brings fresh blood to the old settlements. When the influx is heavy, then this particular ethnic group flourishes; if it is weak, the ethnic group declines; if immigration ceases altogether, then submergence into the American way of life is but a matter of time. Every nationality of the white race in the United States is subject to this unalterable law even though the Germans are surely not the ones who acclimatize themselves quickly. The Russian-Germans are even more resistant in this respect than the Germans who immigrated from the Reich [German Empire], for they were accustomed to living as colonists in foreign surroundings, and thus they held tenaciously to their native tongue and tradition. But even at that, they cannot swim against the tide of assimilation in America." Front cover of the "Manual of the United States" that belonged to Gottfried Schreiber. This booklet was used as part of his citizenship classes held at the Albina Homestead School. Courtesy of Vernon Schreiber. Inside cover of the "Manual of the United States" that belonged to Gottfried Schreiber. This booklet was used as part of his citizenship classes held at the Albina Homestead School. Courtesy of Vernon Schreiber. 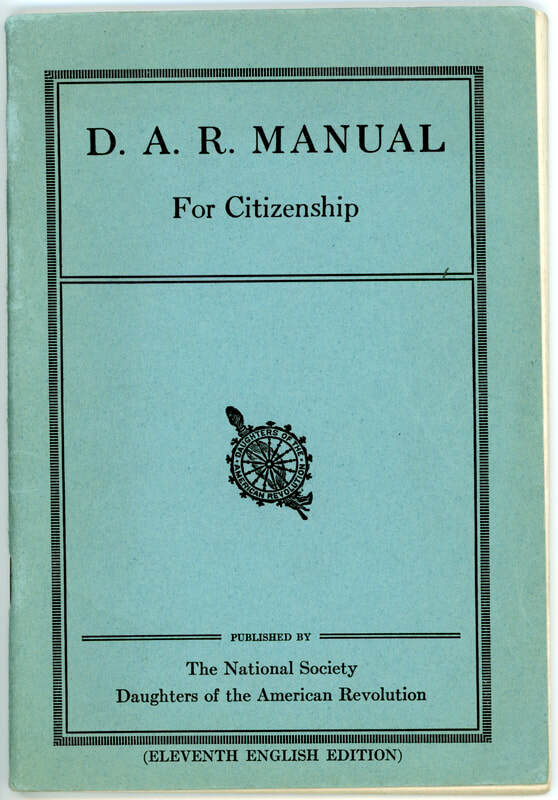 Front cover of the "Daughters of the American Revolution Manual for Citizenship". 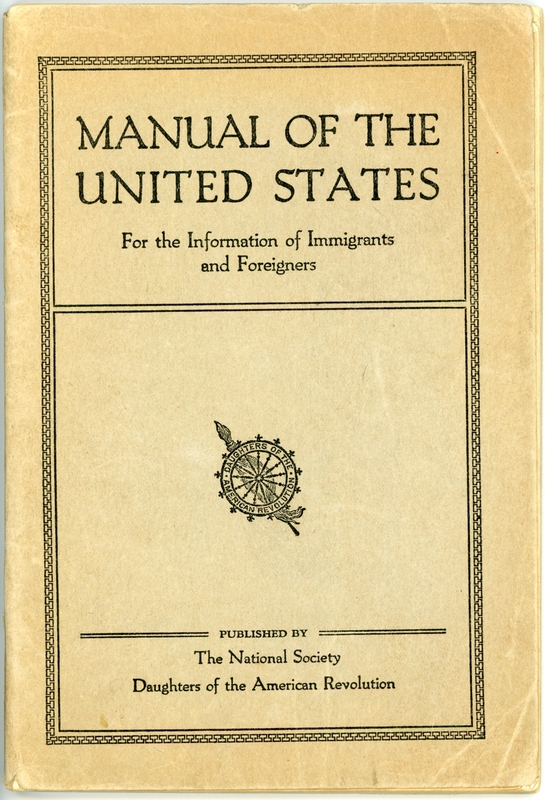 This booklet was used as a U.S. citizen study guide by Gottfried Schreiber who immigrated in 1908. Courtesy of Vernon Schreiber. 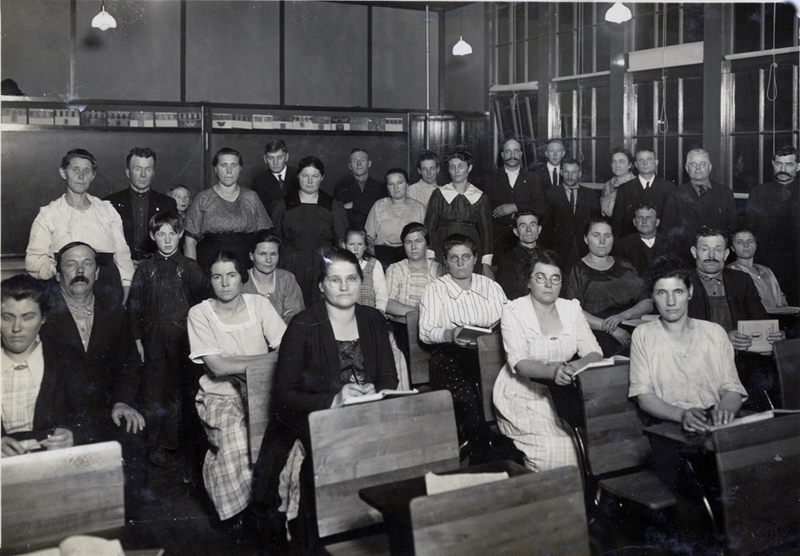 1922 citizenship class held at Sabin School. 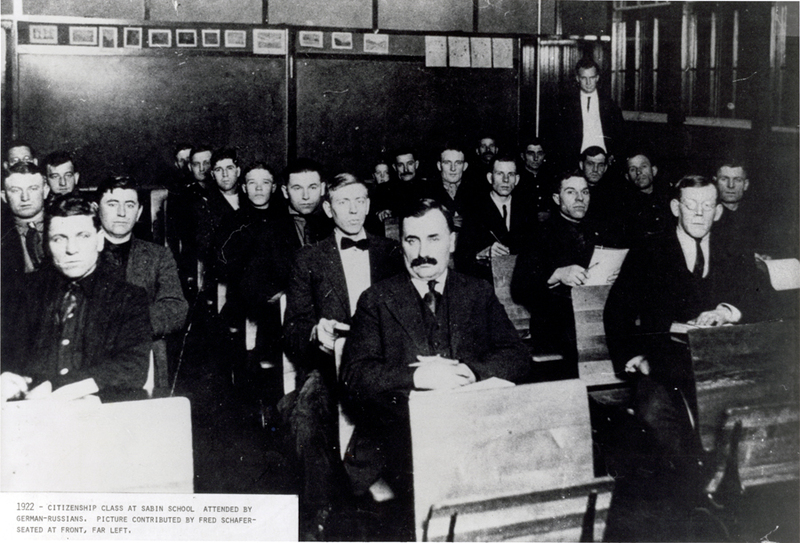 Most of the men in the class are of German-Russian origin. Photograph courtesy of Sheryl Scarbrough. 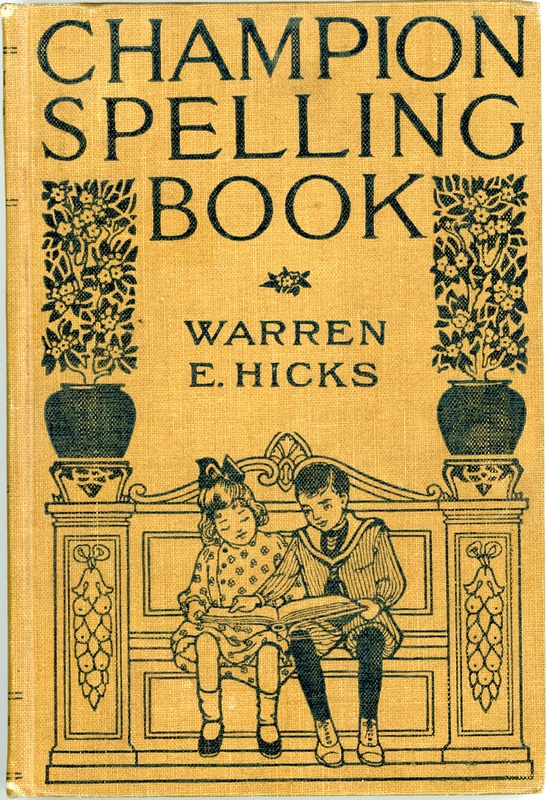 Front cover of the "Champion Spelling Book". 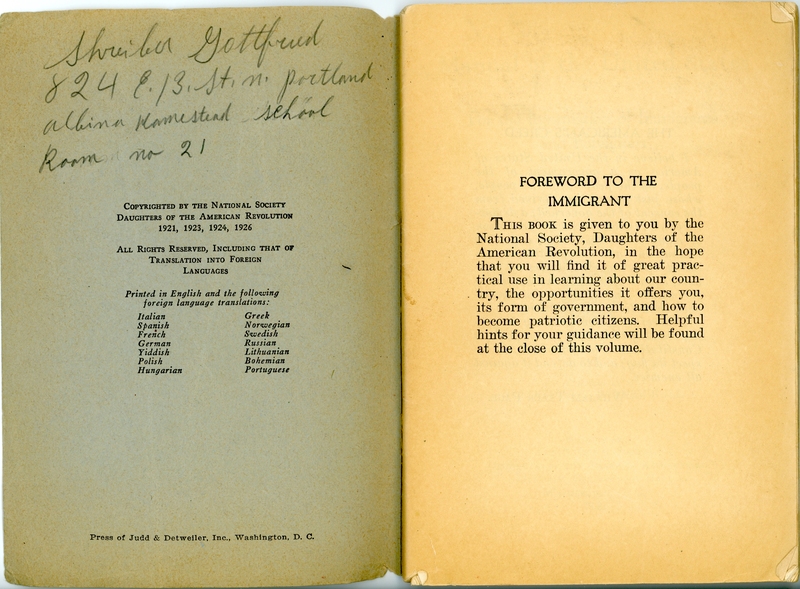 This book was used as a citizenship study guide by Gottfried Schreiber who immigrated in 1908. Courtesy of Vernon Schreiber. This photograph of a 1921 U.S. Citizenship Class held at Sabin School in NE Portland was published in "The Oregon Journal" on November 15, 1976. The Vanport flood of 1948 resulted in the relocation of the African American population in Vanport (about 25 percent of the 40,000 inhabitants) to the Albina area. These people were not given a choice to live in other parts of Portland because of "redlining" practices. The term is said to have received its name by bank officials that would hang up maps and draw red circles around minority neighborhoods to avoid investing in them. The City of Portland did not challenge this practice. The rapid change in the racial mixture of Albina created fear and tension in the community, causing many people to relocate to East Multnomah County and other parts of the metropolitan area. With the beginning of construction of the Veterans Memorial Coliseum in February 1959 and the significant displacement of many people in the community caused by the Interstate 5 project through Portland in the late 1950's, the old Volga German settlement area in Albina began to further fragment and spread out to the eastern neighborhoods of Portland, Parkrose, and Gresham. It became evident to several of the church congregations that if they wanted to remain intact, they would have to relocate to the primary resettlement areas. Both the Second German and Zion German Congregational churches made the decision to move east. Both congregations also voted to anglicize their names (to the Evangelical Congregational Church and the Rivercrest Community Church, respectively) to distance themselves from their German origins and further assimilate into the diverse society around them. Only the Ebenezer church continued in the old Albina settlement, finally closing in 1994. Marie Trupp Krieger expressed the prevailing feeling of many in the community. "We did what we were supposed to. We assimilated." In 1959, Emma Schwabenland Haynes reflected on the assimilation of the Volga Germans into American society. "At the time of grandfather's death, the words "our people" were constantly used by members of the family. The phrase had a double meaning. It referred not only to one's relatives, but also the the Volga Germans as a whole. To a great extent the two meanings were interchangeable, because the only relative that a person was likely to have were Volga Germans.... At the present time the words "my people" have lost all meaning for a man whose children and grandchildren are of mixed backgrounds. He simply thinks of himself as an American, and his grandchildren, in many cases, don't even know that there was once a colony in Russia named Norka.. At most, they may have a dim consciousness of the fact that some of their ancestors were German. I do not say this with any feeling of regret. The United States became a great nation because immigrants of all nationalities gave up their loyalty to the country of their origin and became unqualified Americans. No thinking person would want America to consist of tight islands of hyphenated citizens living physically in the United States but emotionally in Europe. And it is only right that the Volga Germans should also become part of the bloodstream of our nation." "World War I produced a strange paradox for the former Volga villagers. Anti-German sentiment ran deep in Portland but these folks were hybrids. Better, they undoubtedly reasoned, to be a 'damned Rooshun' than a 'hated Hun.' Still they clung to their roots and it wasn't until the beginning of the next Great War that the well-entrenched community began to break down. Financial pressures during the Depression forced widespread splits in the old family cohesion. A society centered on church life suffered as the size of congregations dwindled. Then, the war, which took the young men for military service and brought a huge wave of shipyard workers to the area, dealt the final blow. The offspring of the Volga immigrants disseminated throughout Portland and elsewhere as another group of newcomers began to take their place. Like the Russian Germans, who had been a distinct minority, the blacks that concentrated in Albina, did so not only because of available housing at affordable rent. They, too, had a need for belonging - a sense of community in the midst of the larger, often unfriendly, world." The Volga Germans are now a seamless part Portland's fabric. After decades of assimilation, many descendants of this ethnic group know little about their ancestry and ethnic heritage. 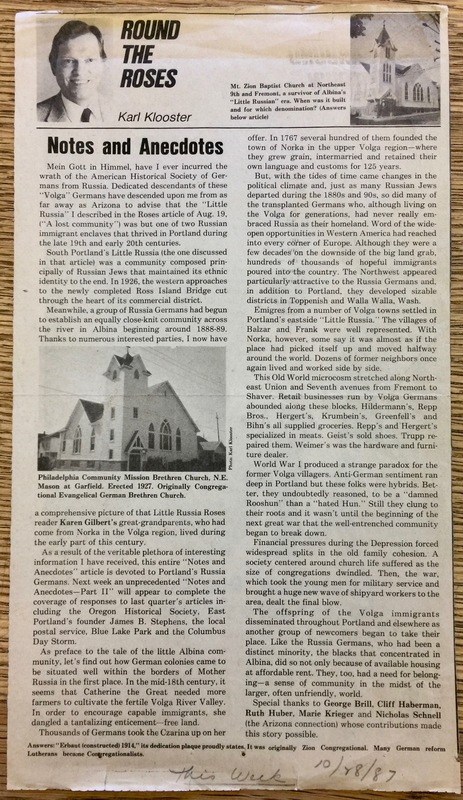 Organizations such as the Oregon Chapter of the American Historical Society of Germans from Russia and The Center for Volga German Studies at Concordia University continue their work to educate and preserve the history and traditions of the Volga Germans in Portland. ​Klooster, Karl. "Little Russia: A Lost Community." 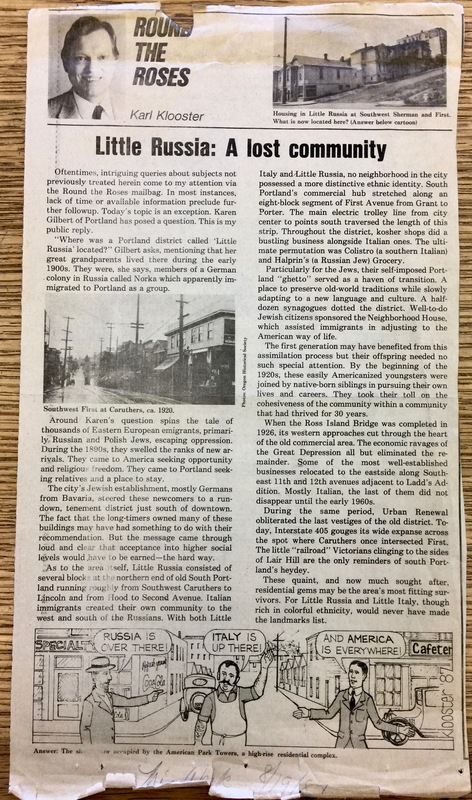 The Oregonian [Portland, Oregon] 19 Aug. 1987, This Week Magazine - Round the Roses Column. Print. Sullivan, Julie, "Portland's Germans from Russia Celebrate History." The Oregonian [Portland], April 8, 2000.